Each box contains 1 hand-drawn colored sketch card from one of more than 60 contributing artists! 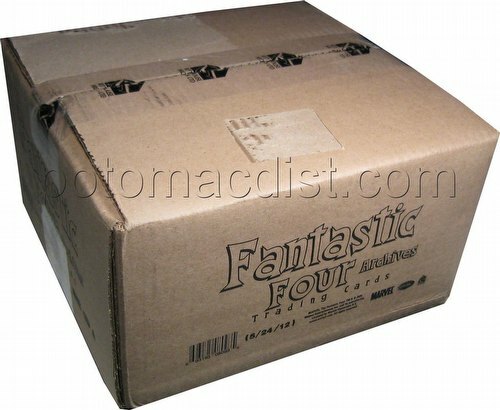 This set will cover all of the key storylines from the Fantastic Four books starting with issue #1 from 1961 all the way to #561 from 2008! Insert sets will include an 18-card Ready For Action set, a 9-card Nemesis set (featuring some of the Fantastic Four's worst enemies), and a 9-card Legendary Heroes set (featuring various members of the Fantastic Four over the years). 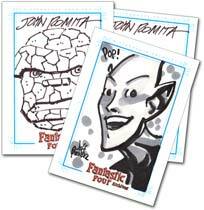 In addition, there will be a limited number of black and white hand-drawn sketch cards from industry legends and current top artists randomly inserted. Each case will include a poster featuring the first 100 issues of The Fantastic Four. Customers pre-ordering 4 cases (48 boxes) receive a hand-painted oil sketch card by Bard. Customers pre-ordering 10 cases (120 boxes) receive a sketch card by Nar! Following on the heels of 2006's SOLD-OUT "The Complete Avengers" and 2008's SOLD-OUT "The Women of Marvel",	comes an all-new set of trading cards based on Marvel comics first family team of Super Heroes, The Fantastic Four. This comprehensive trading card collection will cover all of the key storylines from the Fantastic Four books starting with issue #1 from 1961 allthe way to #561 from 2008! Each box of this set will feature 1 Hand-drawn and Colored Sketch Card from over60 different artists. Below is the list of artists that have agreed to participate in this trading card set so far. 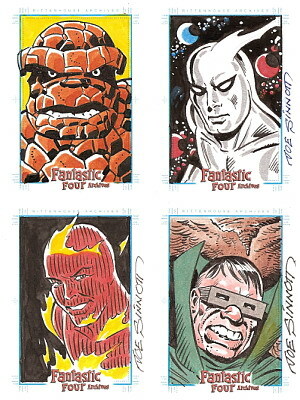 As a SUPER ADDED BONUS, look for hand-drawn sketch cards from both industry legends and today's top comic book artists. These Black and White sketch cards will be randomly inserted as a bonus card along side the colored sketch card in the box. Here is just a small list of artists that have agreed to provided some of these very limited edition cards. We hope to continue to add artists as we get closer to the release date.  More to be announced! 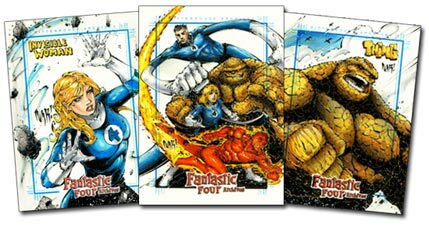 Each case will come with an exclusive all-new poster featuring the first 100 issues of The Fantastic Four.For every ten cases purchased you will receive a sketch card drawn by Nar!